Looking North East towards Napier from Te Mata Peak – photo courtesy of Te Mata Winery. The world seems to love New Zealand Sauvignon Blanc, especially from Marlborough on South Island. Wine drinkers appear to have an insatiable appetite for this lively style of wine with its crisp, green characters softened with tropical exuberance. However the other 30% or so of New Zealand’s wines that are not made from Sauvignon Blanc and do not come from Marlborough are also well worth exploring. My favourite region must be Hawke’s Bay on North Island. This beautiful place is defined by the great sweep of Hawke Bay itself – confusingly the region is called Hawke’s (or more normally Hawkes on wine labels) Bay, while the body of water is Hawke Bay, named by Captain Cook in honour of Sir Edward Hawke, First Lord of the Admiralty. It is a largely rural place and includes some spectacular countryside, but the urban centres offer many charms too. The city of Napier was destroyed by an earthquake in 1931 and was totally rebuilt in the, then, current Art Deco style. Nearby Hastings is the other centre and was also largely rebuilt in the Art Deco style. This time capsule of 1930s glamour makes these cities wonderfully evocative places to wander around. The Hastings suburb of Havelock North, very near Te Mata peak, with its relaxing villagey feel is a lovely place to visit too. Wine map of Hawke’s Bay – click for a larger view. Although it has been surpassed by Marlborough in recent decades and now only produces around 10% of New Zealand’s wine, Hawke’s Bay is still the second largest wine region in the country and the principal centre for red wine production. What I love here is the sense of history, the first winery was established in 1851 – 120 years or so before vines were grown in Marlborough. In fact several of the leading producers here including Mission Estate, Te Mata, Church Road, Vidal Estate and Esk Valley were all well established by the 1930s. Of course history never flows in a straight line and although there was indeed a brief flowering of dry wine production here in the late nineteenth and early twentieth centuries with the likes of Te Mata winning awards for their pre World War I “clarets”, the real demand in the days of the British Empire was for Port and Sherry substitutes, fortified wines. It was not until the 1970s that the emphasis moved to dry wines and another twenty years before Hawke’s Bay started to acquire the reputation as a wine region, especially for reds, that it enjoys today. Being half way up North Island, Hawke’s Bay is one of the warmest areas in New Zealand and enjoys a long growing season. This enables Hawke’s Bay to specialise in grape varieties that simply cannot ripen in the cool maritime conditions further south. That being said, it is still a temperate and moderate climate. This contrasts with almost all other “New World” wine producing countries which have hotter Mediterranean climates. The temperatures in the growing season are a bit warmer than Bordeaux, but cooler than California’s Napa Valley. Of course nothing is simple, so where the grapes grow within Hawke’s Bay is an important consideration. The coastal zone is appreciably cooler than the areas further inland. 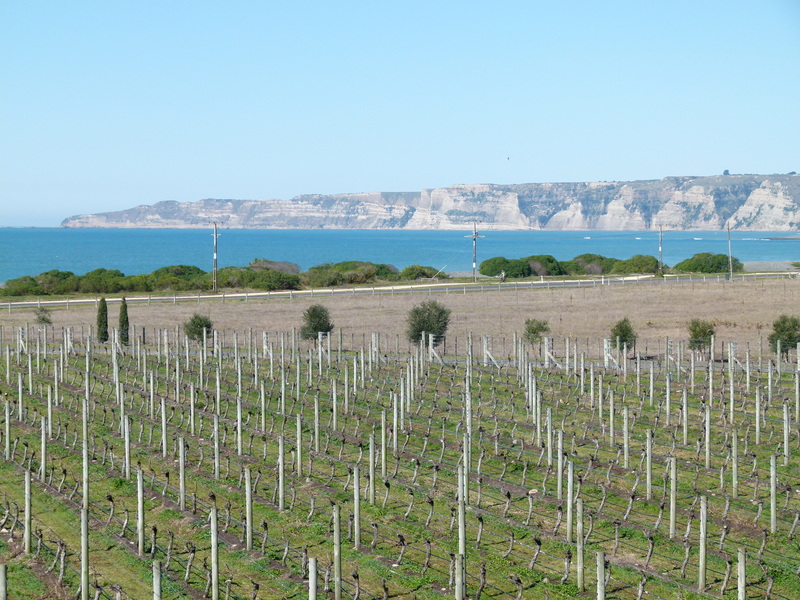 This means that the best quality white grapes tend to be grown nearer the ocean, where most of the black grapes will not ripen, and the best black grapes flourish further inland where the extra heat and shelter helps them to achieve full ripeness. 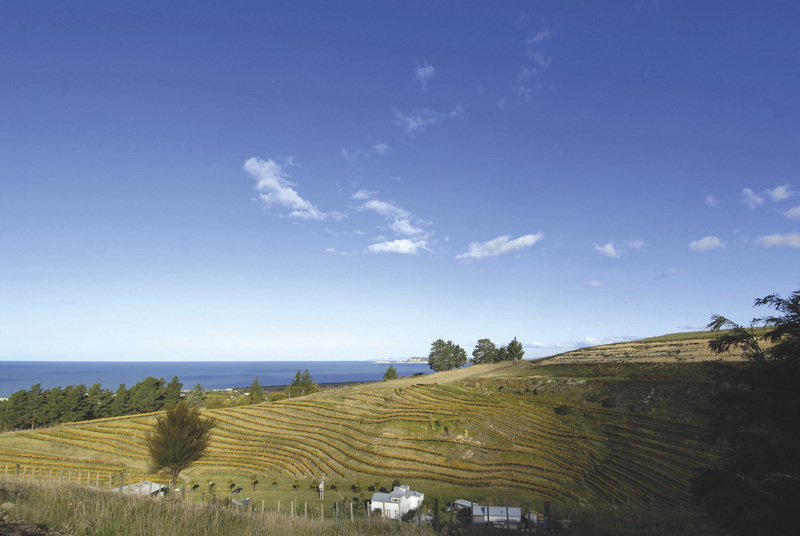 These varied conditions mean that Hawke’s Bay can offer an incredible variety of wine styles. The inland temperatures are some 7˚C or so more than the coast. 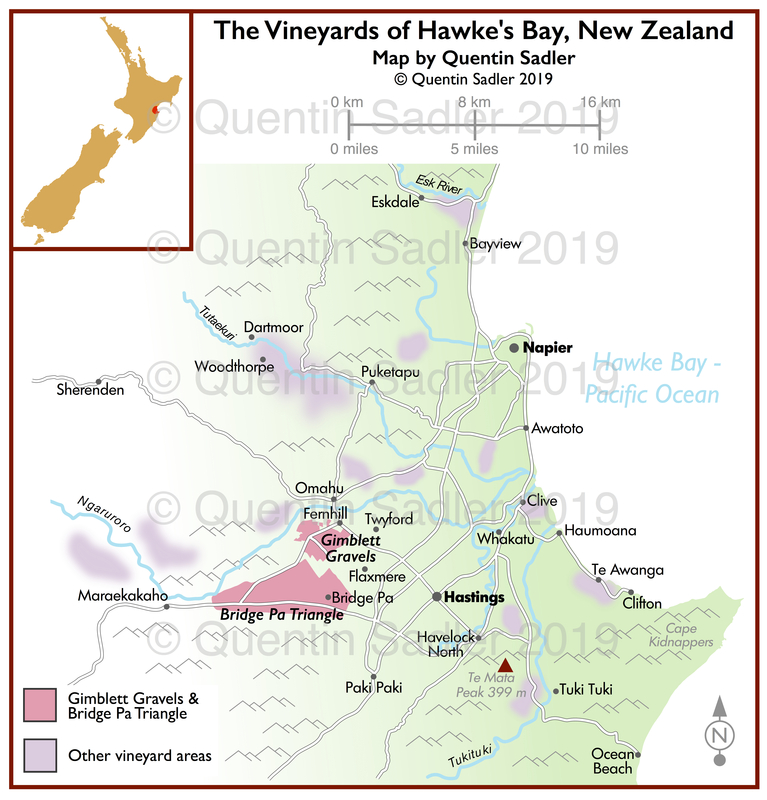 This makes it possible for Hawke’s Bay to ripen some grape varieties that defeat almost every other New Zealand region, except Waiheke Island far to the north. Merlot, Malbec, Cabernet Franc, Syrah and even Cabernet Sauvignon all thrive here. Of course New Zealand can almost never produce those big, rich, fruity wines like Australia and California do, there just isn’t enough heat for that. So whether you are drinking a Bordeaux style blend of Merlot and Cabernet, or a Syrah, these reds will usually be more delicate than other new world examples, but fruitier and softer than their European counterparts. Misty hills beyond the vineyards in the Tukituki Valley – photo by Quentin Sadler. The dominant grapes being Merlot, Cabernet Sauvignon and Syrah is almost serendipitous as New Zealand is famous for producing lamb. Merlot-Cabernet blends, like red Bordeaux from the same grape varieties, are a fine match with lamb. Syrah is not only great with lamb, but also partners venison really well and New Zealand is a major producer of that meat too. As for white grapes, the real speciality is Chardonnay as these conditions, create wines with ripeness and texture as well as fine acidity – think White Burgundy with more fruit. As you might expect though, they also produce Sauvignon Blanc and these tend to be riper, more mouth filling and textured than those from Marlborough. Looking towards Cape Kidnappers from Elephant Hill – photo by Quentin Sadler. The soils provide little nourishment and are free draining, which helps to produce concentrated and complex wines as the vines have to work hard and dig deep for goodness while any excess water just drains away rather than making the grapes dilute. 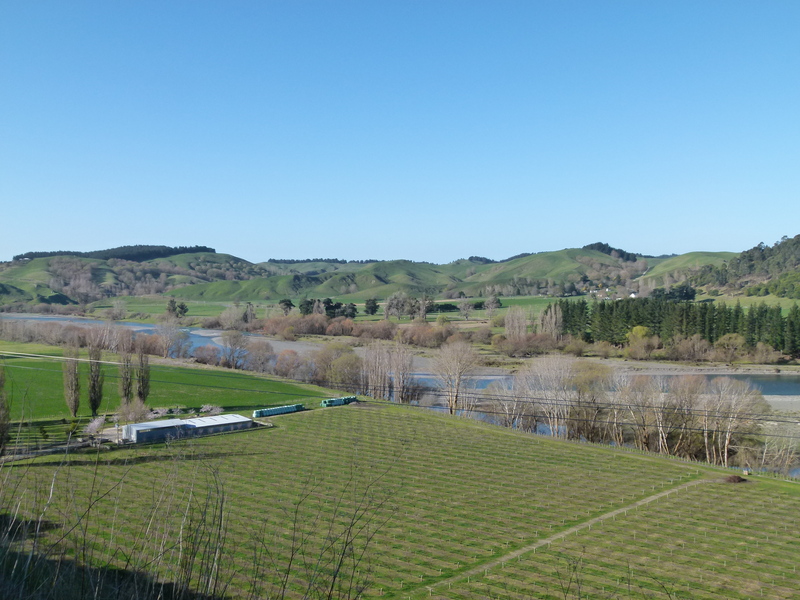 Much of the terrain has been formed by five ancient rivers – the Wairoa, Mohaka, Tutaekuri, Ngaruroro and Tukituki – moving over centuries to form valleys and terraces and leaving behind over 25 different soil types including clay loam, limestone, sand and gravel. Gimblett Gravels soils – photo by Quentin Sadler. 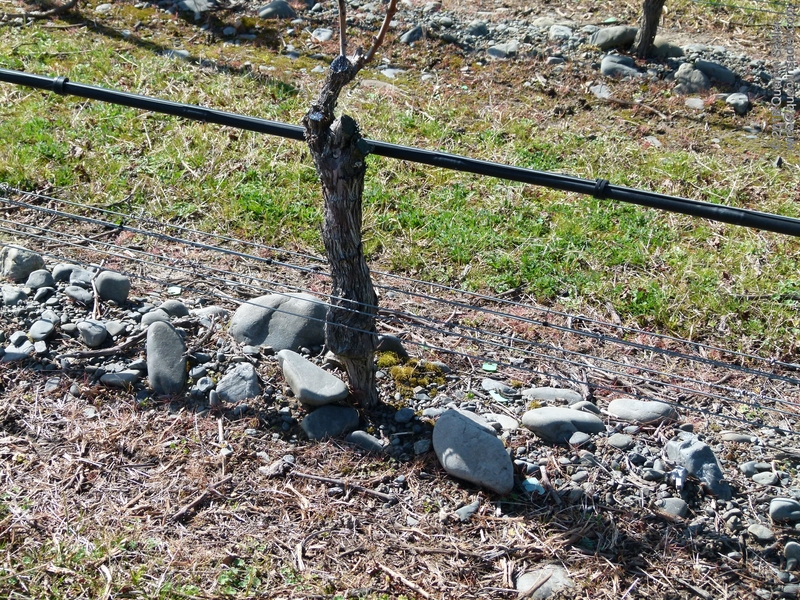 Gravel is the most famous soil here with one of the most important sub-regions of Hawke’s Bay actually being called Gimblett Gravels. This warm area was formed by the Ngaruroro (pronounced Na-roo-roe-roe) River changing route after a huge flood in 1867. The deep gravel soils it left behind have almost no organic component, so give low vigour and perfect drainage. This means the area can produce world class red wines with concentration and ripeness together with the elegance and freshness that the relatively cool conditions give, even in this warm part of New Zealand. 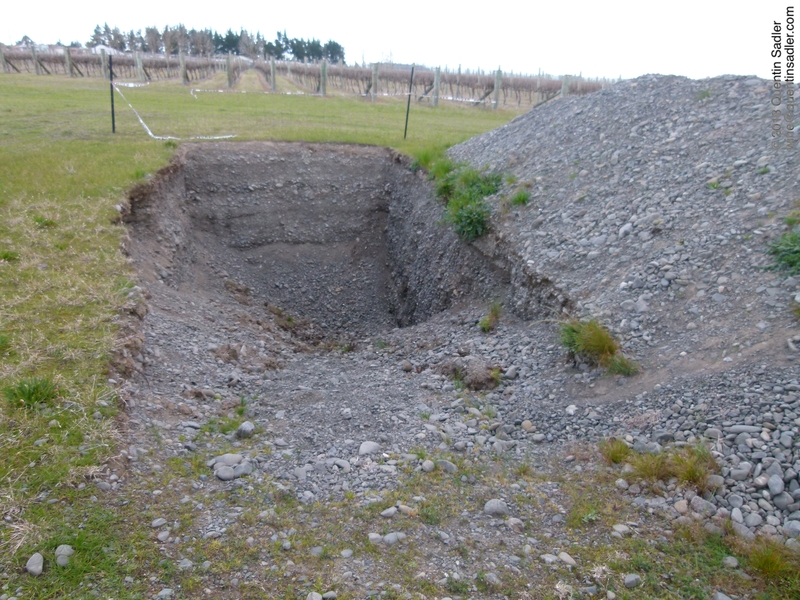 Ever since wine growers were first aware of the Gimblett Gravels in 1981 it has been seen as primarily a red wine area. It pretty quickly became known for Bordeaux style blends of Merlot and Cabernet Sauvignon, often with some Cabernet Franc and Malbec too. Vines growing in the Gimblett gravels – photo by Quentin Sadler. In more recent years Syrah has started to challenge that dominance and although the amount of Syrah grown is quite small it has quickly earned a very high reputation for quality. Some other black grapes grow here too, with small plantings of Grenache and Tempranillo showing great promise. White grapes make up about 10% of the plantings with some superb Chardonnays and Viogniers as well as a little Arneis, Gewürztraminer and even Riesling. The Bridge Pa Triangle is an area just a little further inland from Gimblett Gravels. It has similar gravel soils but under a deep layer of loam topsoil, which often makes the wines softer and more aromatic. There are other sub-zones of Hawke’s Bay too, but you are unlikely to see their names appearing on labels anytime soon. To my mind the wines coming out of Hawke’s Bay make perfect restaurant wines. They can provide an attractive half-way house between new world fruitiness and richness and the dryness of European wines. This makes them very food friendly and versatile with food or without. What’s more they have that clean and bright New Zealand character that can be very appealing. Also like most new world wines, they usually deliver as soon as the bottle is opened, without needing to be left to breathe for a little while to show at their best. 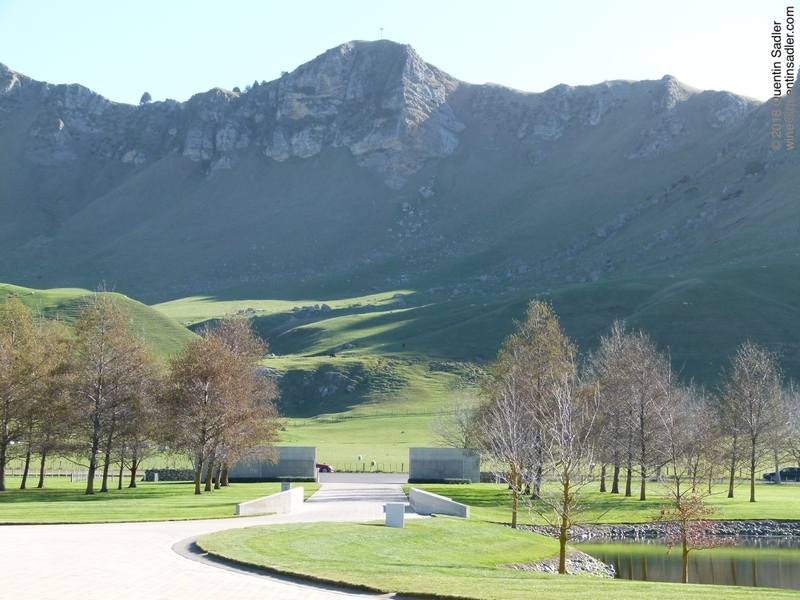 Looking towards the Te Mata Hills from Craggy Range – photo by Quentin Sadler. The Hawke’s Bay specialities are most certainly Chardonnay, Bordeaux-style blends of Merlot and Cabernet and Syrah, but there is so much more going on too. Reds from Malbec, Tempranillo, Grenache and even some Pinot Noir in the cooler places. As for whites there is also fine Sauvignon Blanc, Sauvignon Gris, Sémillon, Viognier, Pinot Gris, Arneis, Gewürztraminer, Riesling and more. So, stylistically it is very hard to pin the region down, but very rewarding to try. 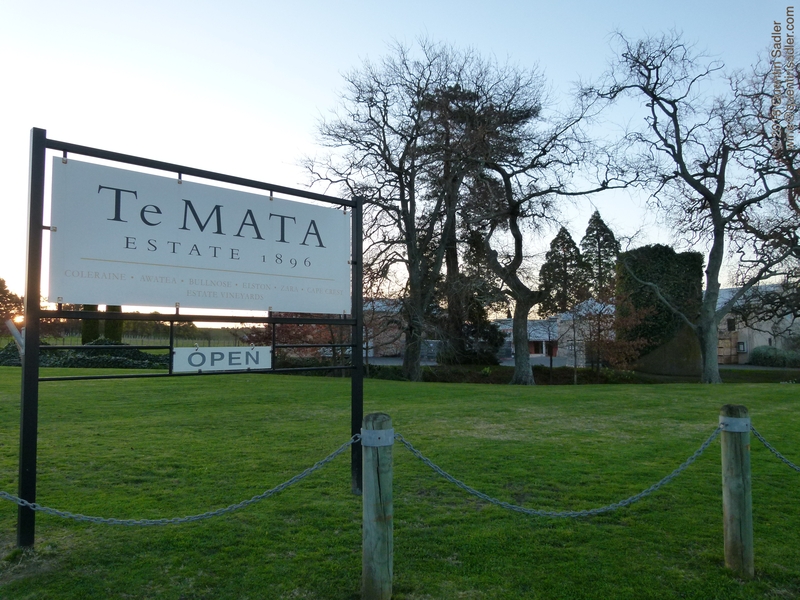 One of the grand old names of Hawke’s Bay, Te Mata has been continuously operating since 1892 and is based in a beautiful Art Deco building right by Te Mata peak. The vineyards and winery were completely renovated in the 1980s and they have never looked back. 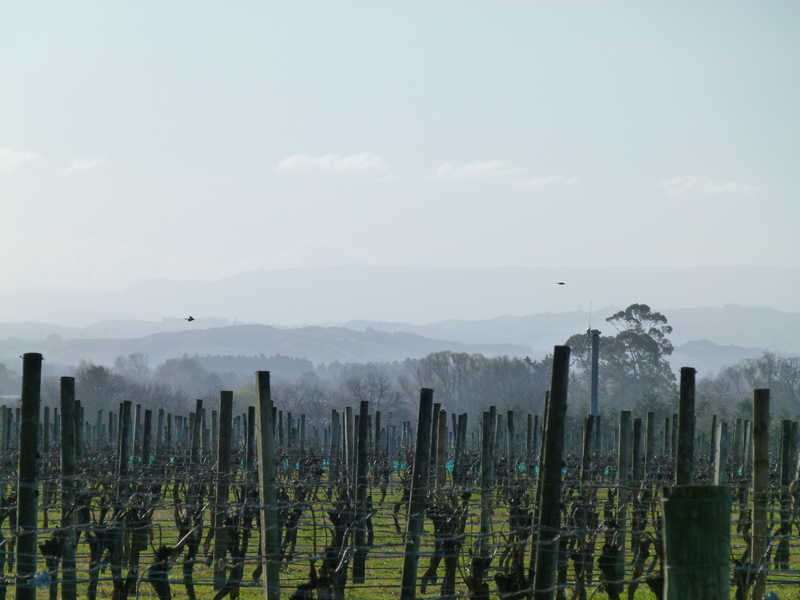 Today they have extensive vineyard holdings in Woodthorpe and the Bridge Pa Triangle as well as the original nineteenth century vineyards at the foot of Te Mata peak itself. Made under the guidance of Peter Cowley, one of the funniest winemakers I have ever met, the range is wonderfully creative and includes a fine oaked Sauvignon and delicious single vineyard Gamay. Peter Cowley, the witty, engaging and passionate Technical Director at Te Mata. One of those winemakers that I could listen to for days – photo by Quentin Sadler. Try: Te Mata Coleraine is a blend of Cabernet Sauvignon, Merlot and Cabernet Franc. Aged for 18 months in barrel it is widely considered one of the very best red wines from New Zealand. I consistently like the restrained, elegant style and the freshness that keeps it irresistibly drinkable. Available in the UK for £56.99 per bottle from The New Zealand House of Wine. 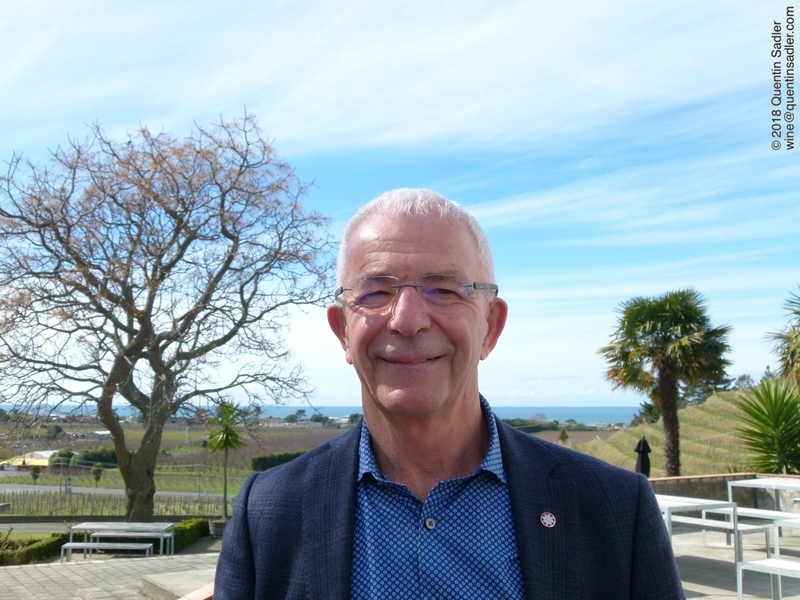 Warren Gibson, long serving chief winemaker at Trinity Hill – photo courtesy of New Zealand Winegrowers. This winery only dates back to 1993, but that makes them almost pioneers as far as New Zealand wine is concerned and they have certainly made their mark. Initially it was a joint venture between famed Australian winemaker John Hancock and Robert and Robyn Wilson, owners of London’s The Bleeding Heart restaurant. Chief winemaker Warren Gibson has been there since 1997 and he produces a range of beautiful wines that perfectly illustrate how diverse Hawke’s Bay can be – they even make a rich and aromatic blend of Marsanne and Viognier and a suave Pinot Noir. Try: Trinity Hills Gimblett Gravels Syrah – this shows perfectly why Hawke’s Bay is good for Syrah. The cooler climate really defines this wine with its lively fruit and floral aromas. The luscious palate has ripe blackberry fruit, soft spices, integrated oak and ripe, sweet tannins. There is always a sense of freshness and purity in good Hawke’s Bay Syrah that sets it apart. Available in the UK for £20.99 per bottle from The New Zealand House of Wine. Vidal Estate Winery – photo courtesy of Vidal Estate. Spaniard Anthony Vidal opened his eponymous winery in an old racing stable in 1905. 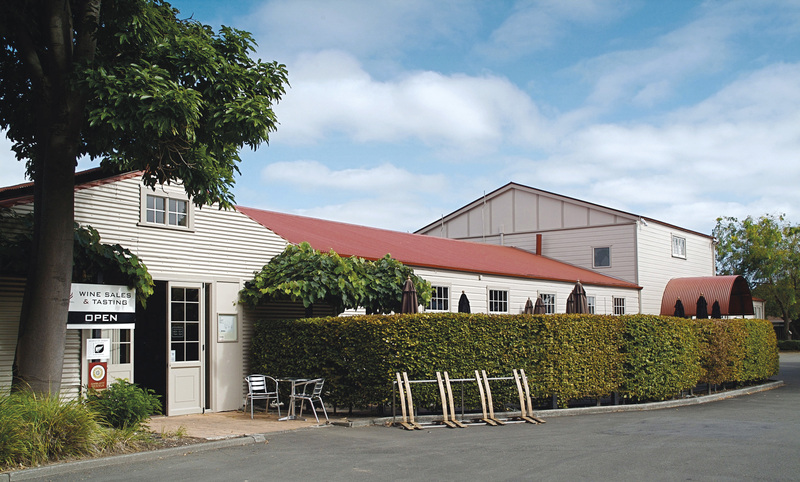 Owned by Villa Maria since the 1976 it opened New Zealand’s first, and still very fine, winery restaurant in 1979. 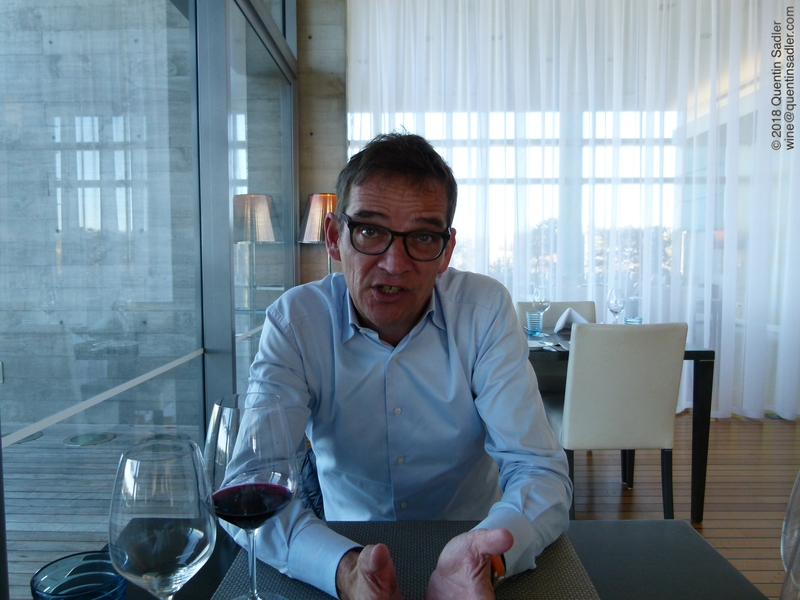 Hugh Crichton has been the winemaker for many years now and his deft hand seems to do no wrong. He has a particularly high reputation for his Chardonnays, but the Syrahs and Cabernet blends are mighty fine too. 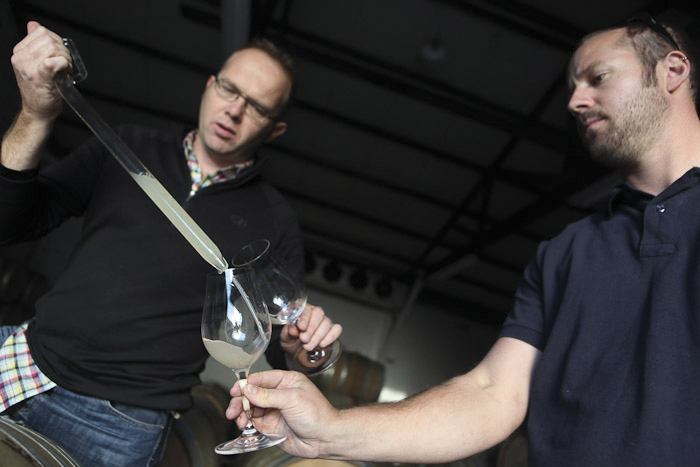 Hugh Crichton (left) in the cellar – photo courtesy of Vidal Estate. Try: Vidal Estate Merlot-Cabernet Sauvignon is a great introduction to Hawke’s Bay reds. The palate is bold and richly fruity with smooth tannins, smoky oak and a touch of spice – 5% Malbec in the blend helps with the pizzazz. Available in the UK for £14.00 per bottle from The New Zealand Cellar. Vineyards at Craggy Range from their fabulous restaurant – photo by Quentin Sadler. 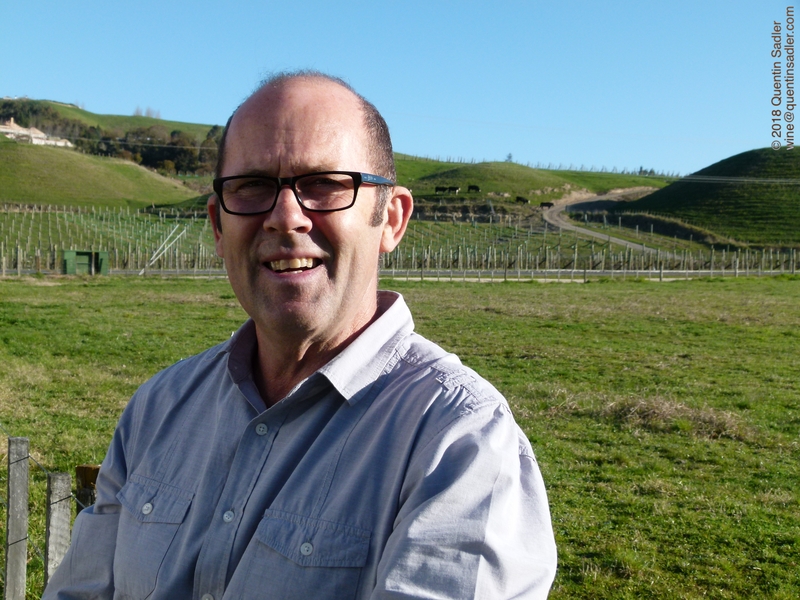 Businessmen Terry Peabody and revered viticulturist / winemaker Steve Smith MW created Craggy Range in the 1990s and quickly established themselves as one of the great names of Hawke’s Bay. 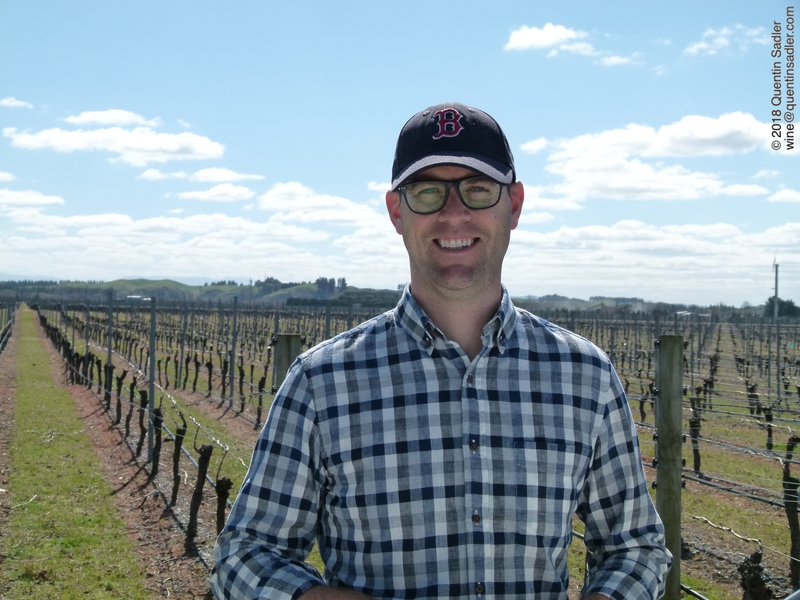 Today chief winemaker Matt Stafford crafts a superb range of wines from vineyards in the Gimblett Gravels and the cooler coastal area near Cape Kidnappers. 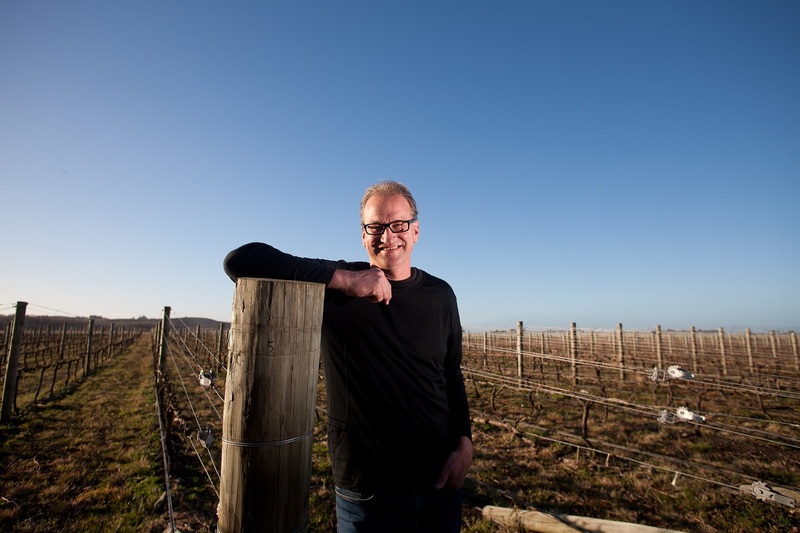 Matt Stafford, the chief winemaker at Craggy Range – photo by Quentin Sadler. Try: Craggy Range Kidnappers Vineyard Chardonnay – the cool coastal conditions really define this wine with its freshness and minerality, subtle richness and restrained use of oak – think Chablis 1er Cru with a bit more soft fruit. Available in the UK for £17.99 per bottle from Waitrose Cellar. 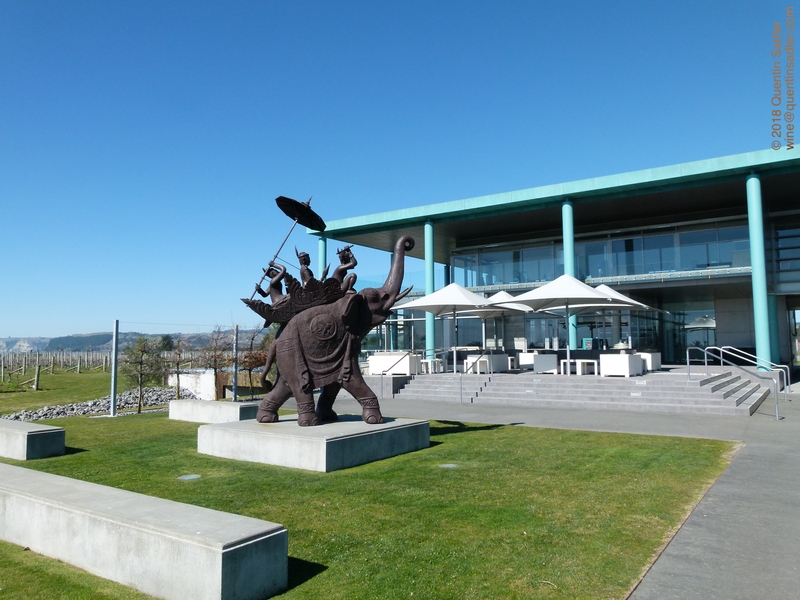 The only elephant at Elephant Hill Winery – photo by Quentin Sadler. Founded in 2003 this estate is another newcomer that has a built a huge reputation for itself very fast. It is managed by the charming Andreas Weiss whose parents created Elephant Hill after falling in love with the area while on holiday from their native Germany. 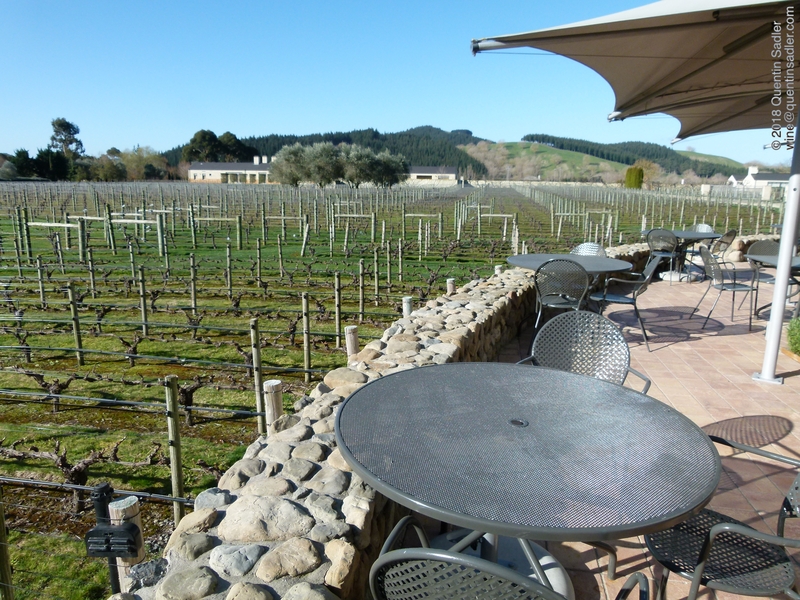 The winery is surrounded by vines and sits almost on the cliff edge at Te Awanga. This is where they grow their white grapes while the reds and richer whites are grown in their Gimblett Gravels and Bridge Pa Triangle vineyards. The winery boasts incredible views and a great restaurant. As to the name, Andreas told me, “there’s no hill and there’s no elephant, but you certainly remember it”. Andreas Weiss of Elephant Hill – photo by Quentin Sadler. Try: Elephant Hill Sauvignon Blanc – a pure and vivacious style, but rounder and more textured than a typical New Zealand Sauvignon. It feels clean, precise and beautifully defined too, with wonderful salty minerality cutting through the ripe citrus fruit. Available in the UK for £16.50 per bottle from Corney & Barrow. Esk valley’s terraced vineyard, home to the Terraces, one of New Zealand’s finest reds – photo courtesy of Esk Valley. This famous winery sits right on the coast some 10 km north of Napier and was originally a fortified wine producer that fell into disuse by the 1970s. George Fistonich of Villa Maria bought it in 1986 and it has never looked back. For the last 20 odd years it has been left in the talented hands of winemaker Gordon Russell who has happily put all the old prewar concrete fermentation vats to use for his red wines and who revels in his reputation for being something of a maverick who makes true handmade wines. 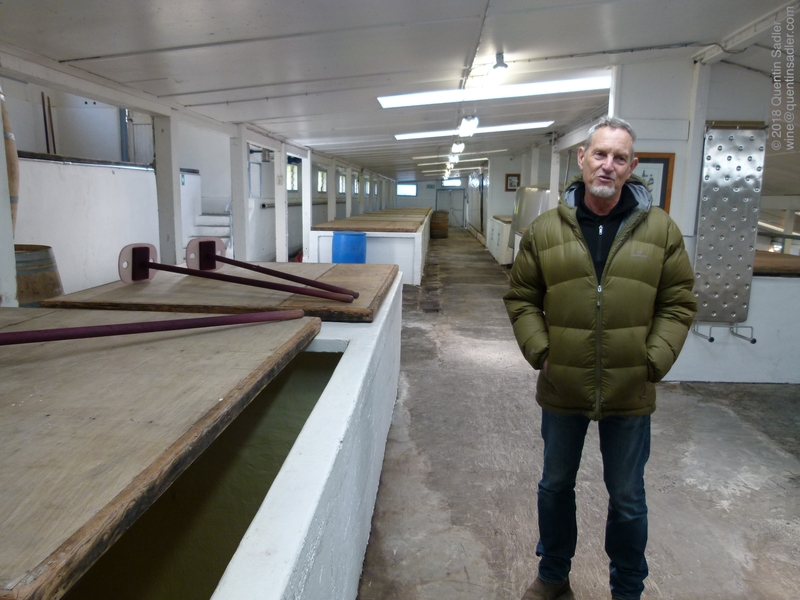 Gordon Russell with his beloved pre-war concrete fermentation vats at Esk Valley – photo by Quentin Sadler. Gordon crafts one of New Zealand’s most famous reds, Esk Valley The Terraces, from a one hectare block of vines on a terraced vineyard overlooking the ocean right by the winery. Try: Esk Valley Verdelho – this grape is mainly used to make fortified Madeira, but this is an unfortified style that has a lovey brightness to it and enticing aromatics. I love the mandarin-like acidity, the rich palate and the little touch of salinity on the fresh, lively finish. It’s wonderful with oriental food. Available in the UK for £13.75 per bottle from The Oxford Wine Company. The Ham Family of Alpha Domus – photo courtesy of the winery. This estate is a real pioneer of the Bridge Pa Triangle. It was founded in 1990, pretty early for this sub-region, by the Ham family from the Netherlands. The first names of the five family members who founded and run the winery are; Anthonius and Leonarda together with their sons Paulus, Henrikus and Anthonius – Alpha! They produce a fine range of single vineyard, estate wines from the classic Hawke’s Bay grape varieties of Chardonnay, Merlot, Cabernet and Syrah, as well as Viognier, Sauvignon Blanc, Sémillon and Cumulus, a Traditional Method sparkling Chardonnay. Try: Alpha–Domus The Wingwalker Viognier – in France’s northern Rhône, where Syrah originates, Viognier grows next door, so it makes perfect sense that we are beginning to see more of this exotic, aromatic grape grown in Hawke’s Bay and used either on its own or co-fermented in tiny amounts with Syrah. This is a rich but fresh example with exotic ripe fruit aromas and a succulent and silky palate with ripe peach, pineapple, coconut cream and a touch of shortbread. The balance is lovely and it makes the wine seem pure, yet powerful. Great with firm fish and white meat dishes. Available in the UK for £18.50 per bottle from Noble Green. Villa Maria is an extraordinary company. Created singlehandedly in 1961 by a 21 year old New Zealander with Croatian roots. That young man is now Sir George Fistonich, one of the great figures of the wine world and he still has the same drive and passion all these years later. Villa Maria have vineyards and a winery in Marlborough and Auckland as well as Hawke’s Bay including owning one of the largest parcels of the Gimblett Gravels. To my mind they never put a foot wrong and consistently produce elegant wines that people enjoy, at all price points. 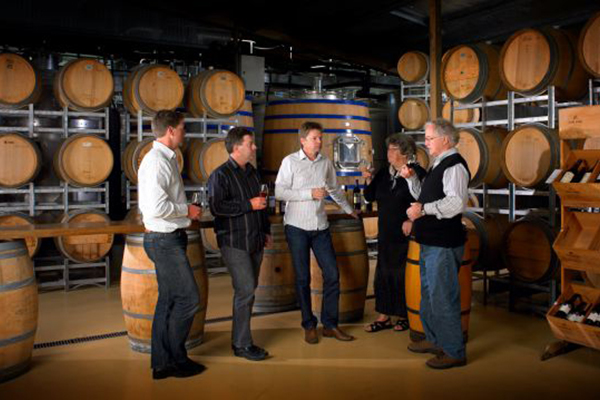 Their Merlots, Merlot-Cabernet blends and Syrahs are all from their Hawke’s Bay vineyards. They recently launched a super premium Gimblett Gravels Cabernet Sauvignon called Ngakirikiri which means “the gravels” in Maori. It’s a stunning wine with beautiful fruit, incredible richness, but also elegance and poise with gentle, supple tannins. Try: Villa Maria Cellar Selection Gimblett Gravels Grenache – a surprisingly rich take on this grape that loves heat and sun. It’s richly fruity with black cherry and dried strawberry characters and lots of spice in the form of white pepper, fresh ginger and clove. Available in the UK for £16.00 per bottle from Noble Green. Of course this selection barely scratches the surface, there are many more fabulous wines from the producers mentioned here, let alone other wineries in Hawke’s Bay. These are all very good though, are easily available and show the quality and diversity that this exciting wine region can produce.